The Two Provinces Kidathon is one for the 8 to 15 year olds. A 100m shoreside swim, followed by a 5km cycle on closed roads and ending with a 1km sprint to the finish! Registration Opens 7 January 2019! The 2019 Two Provinces Triathlon will open for registration on 7 January 2019! NOTE: All details for the 2019 event are provisional and subject to change. 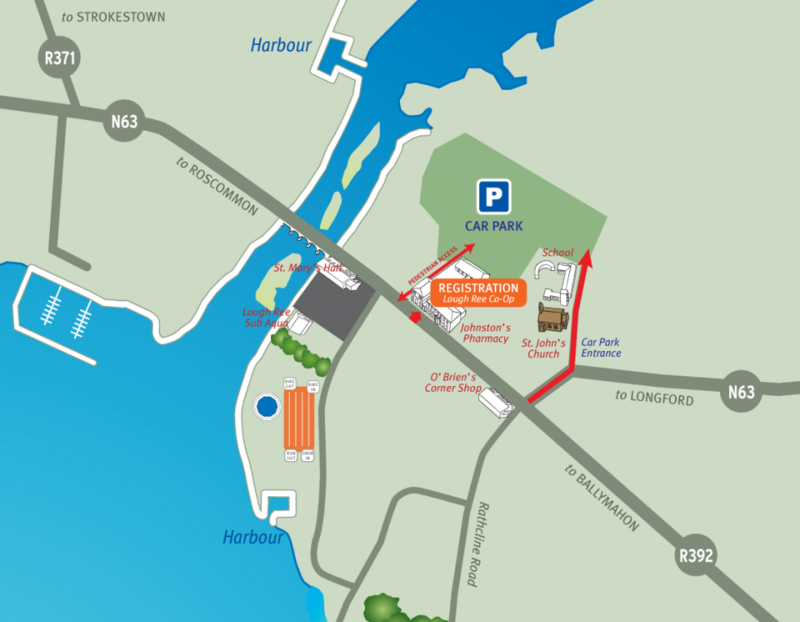 Please see map below of competitor parking for the Two Provinces Triathlon, which will be located on the Longford Road, next to Lanesborough National School. We ask all competitors to park here. It is located a short walk from registration via the pedestrian access. NOTE: Times are provisional and subject to change. Please check back closer to the event. Wave lists will be available here closer to the event. 17:00-18:15 Race sign on will take place in the Co-op Hall located beside Johnston’s Health Bank (across from Supervalu) on Main Street. 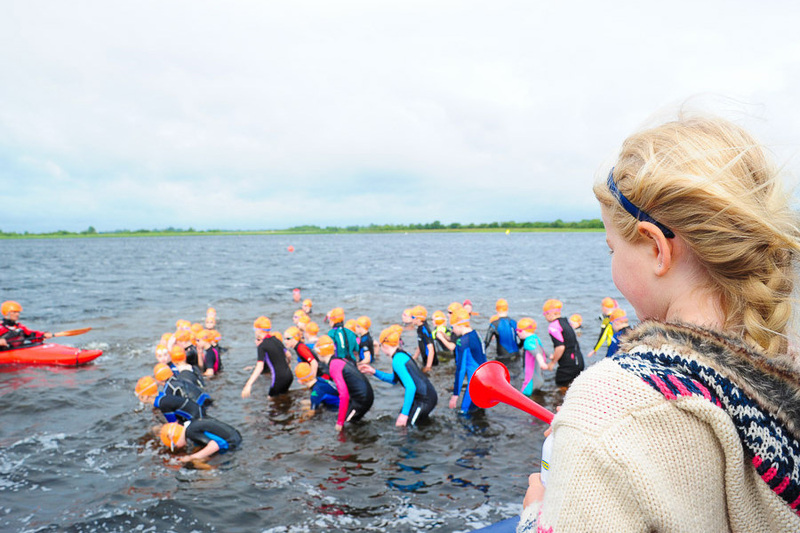 Triathlon Ireland membership or One Day Licences are necessary for the race. It recommended that competitors in the Kidathon use mountain bikes or hybrid bikes as these would be more suited to the road surface in the race. All competitors in the Kidathon will receive a medal directly after finishing the race. You must have your 2019 Triathlon Ireland membership card or One Day Licence in order to race. Only one member of a relay team is required to have a TI or One Day Licence. Your 2019 TI membership card must include a photo. 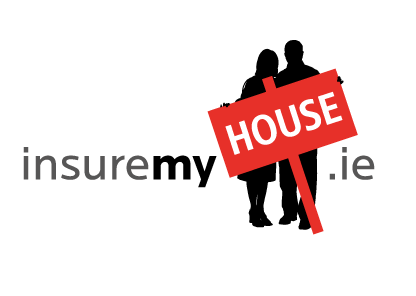 You must bring proof of purchase of ODL to registration. You will not race without presenting your TI card or ODL proof of purchase. Registration will be in the Coop Hall, which is located on Main Street beside Johnston’s Health Bank (across from Supervalu) on Main Street, on Friday from 17:00-18:15. 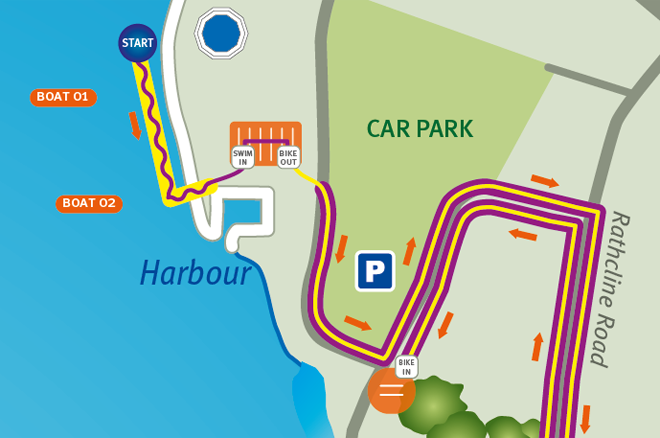 The main transition zone is located beside the car park and harbour on the Lanesboro side of the river. Transition will open on Friday from 18:00-19:00. 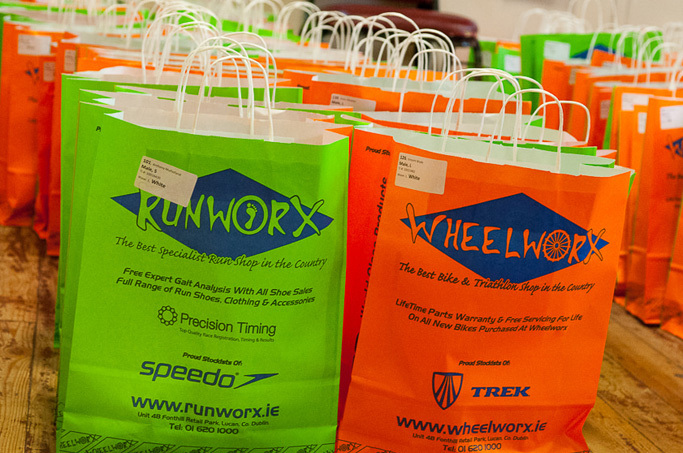 Please note that no bags may be left in transition during the race. Demonstrate that your bike is safe and roadworthy: wheels properly tightened, adequate tyre pressure, functioning brakes, bar stops/ends on handlebars, etc. We take bike security seriously and your bike cannot be taken out of transition without your bib number being displayed. This year there is a secondary transition zone in the Kidathon. This is at the quarry where the Kidathon cycle will end and the Kidathon run will start (see maps below). This is to ease the transition for children from cycle to run and avoid cross over at the main transition zone. The race briefing will take place beside transition at 19:15. Attendance is compulsory. Timing chips must be worn on lower left leg by competitors while on the course. 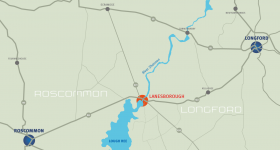 The swim is a 100m shoreside swim in Lough Ree. Your own wetsuits and also the swim caps provided at registration must be worn. The swim will be in three waves at 5 minute intervals starting at 19:30. Competitors will be counted into the water according to start wave. The swim will have a waist- to chest-high, static start, and will not begin until all competitors are in the water. There will be a number of boats and kayakers, as well as life guards on duty to assist swimmers. If you are a weak swimmer it is advisable to stay to the back, as you save energy and time trying to avoid the stronger swimmers. The bike course is a 5km cycle on closed roads, starting out via the quarry and then onto Rathcline Road. The Rathcline Road section is an out and back course returning, via a private road, back into secondary transition at the quarry, where the run course starts on the woodland walk track. The kidathon run is a 1km sprint on the woodland walk track, running as far as the woodland entrance and back to the main transition zone and back to the finish line. This year, there will be a presentation disco in St Mary’s Hall after the race. All competitors in the Kidathon will receive a warrior medal and there are bronze trophies for 1st, 2nd, 3rd by male and female for age groups 8-9, 10-11, 12 and over.